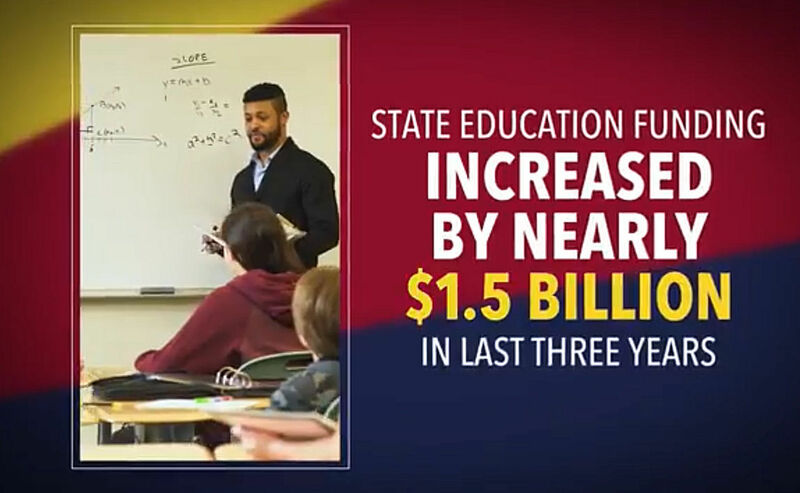 Screen grab from the new commercial being run by business interests to counter what they say is negative publicity about the state’s school system and its funding. “I think you know who we’re talking about,” he said. And this is just the beginning. Benson said future ads featuring upbeat descriptions of the state’s K-12 education system are planned, including an expansion into the Tucson TV market, though he refused to provide a budget. The campaign comes as Gov. Doug Ducey and Republican legislators are under increased pressure to deal with the fact that Arizona is close to the bottom of per-student funding. The commercial is designed to emphasize what has been done since Ducey took office. Yet even the staff of the Joint Legislative Budget Committee acknowledges that, on an inflation-adjusted basis, the state is putting fewer dollars into public schools now on a per-student basis than it did a decade ago. Benson is not disputing those numbers. “It’s more about making sure the other side of the story is told because there is a positive story when it comes to Arizona education,” he said. For example, there’s the National Assessment of Education Progress, a standardized test of what students know. “Arizona students are leading the nation when it comes to improvement in math, English and science,” Benson said. What he does not say is that the scores, while improving, for the most part remain below the national average. For example, just 30 percent of Arizona fourth-graders are at least proficient in reading, versus 36 percent nationally. And 25 percent of Arizona eighth-graders are proficient in science, compared with 34 percent nationally. He also said the commercial is not designed to secure Ducey’s re-election or push for or against specific legislation, pointing out the Arizona Education Project is set up as a 501c(3) charity. But the funding is coming from various groups who have been supportive of the governor — and that also have benefited from the corporate tax breaks that have been phased in, leaving the state with more than $300 million less in revenues now than had the tax rates remained the same. The list of funders provided by Benson include the Arizona Chamber of Commerce and Industry and the Hispanic chambers from Tucson, Douglas, Sierra Vista and Nogales. Money also is coming from the Arizona Lodging and Tourism Association and the Services Group of America, a private firm involved in food distribution. Also donating is Pinnacle West Capital Corp,. which owns Arizona Public Service Co., the state’s largest electric utility. “Too often, all we hear is a drumbeat of the negative and cherry-picked figures to paint a downbeat picture, which is simply not accurate,” Benson said. There has been extensive media coverage of not only Arizona’s national ranking in per-student funding but also the fact that teachers here are paid less than pretty much anywhere else. That point was repeated Monday by Diane Douglas, the state superintendent of public instruction, in her annual State of Education report to the Legislature. At the same time, there is pressure on lawmakers to not only extend the current six-tenths-of-a-cent sales tax for education that will self-destruct in 2021 without action but also expand it to bring in more dollars for teacher salaries and other needs. Several education groups are asking a judge to rule the state is not living up to its constitutional obligation to provide adequate funding for school buildings and repairs. Finally, enough signatures have been gathered to force a public vote in November on a plan approved by lawmakers and signed by the governor to expand a program that provides public dollars for students to attend private and parochial schools. But, said Benson, “For too long, the debate in this state on education has been dominated by negative voices and by organizations and entities that see some kind of political advantage in tearing down our teachers and our schools. Joe Thomas, president of the Arizona Education Association, said as far as he’s concerned, his organization is not one of those groups that are “tearing down teachers.” And he said the commercial is not entirely wrong. “There are wonderful things going on in Arizona,” he said. But it isn’t just the Arizona Education Association that has been beating the drum for more education funding. It also includes the Arizona School Boards Association, made up of board members who are elected in local school districts. And Ogle said there’s nothing wrong with pointing out that, even with the new dollars in the past few years, schools are still not back at pre-recession funding levels. For example, one of the points in the commercial is that education funding has increased by nearly $1.5 billion in the past three years. That, however, includes not just what the state is required by law to fund due to the growth in the number of students plus a legally mandated inflation adjustment, but also the more than $300 million a year going into K-12 education as a result of Proposition 123. That measure, approved by voters in 2016, settled a long-running lawsuit accusing the state of failing to live up to its legal obligations. Report gauged chances for education success, school finance and K-12 achievement.